Beijing is the capital of China and, with an estimated population of 20 million people, its second largest city after Shanghai. 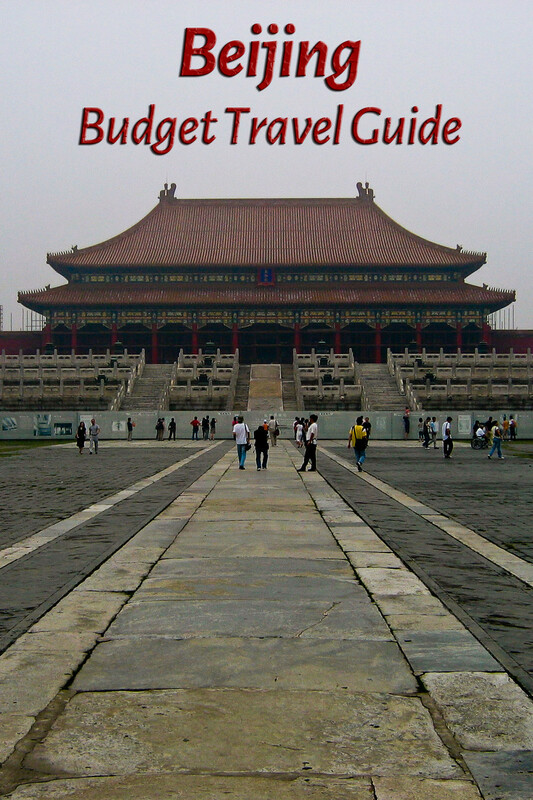 Beijing is incredibly rich in history and historic sights, but its massive size makes it difficult to see all but the most important; it would take a lot of time to see everything and few people are willing to stick around for that long, because, let’s face it, Beijing is not a very pleasant place. It’s crowded, dirty, polluted, with constant traffic jams, air that can make you gag on especially bad days and a preponderance of scams aimed at tourists. Most visitors check out the most famous attractions and quickly move on to more pleasant areas of China. Beijing is very hot and humid in the summer and cold and dry in the winter. September and October are by far the most pleasant months and easily the best time to visit. Spring has comfortable weather, but the dust storms that blow in from the eastern desserts make this season less than pleasant. Crowds and air pollution are both at their worst in the summer and make Beijing a pretty miserable place, when combined with the oppressive heat. Winters are nice, but very cold. Beijing Capital International Airport is located 26 km from the city center. The shuttle buses are the best way to get into town, especially if you have luggage. They cost 16 Yuan and will drop you at numerous locations around town. Public buses are cheaper, but much less convenient (bus #359 will connect you to subway lines 2 or 13 and costs 2 Yuan). The airport express train costs 25 RMB and will similarly connect you to subway lines 2 or 13, as well as line 10. It is much faster than the public bus, but can be a bit of a pain if you have luggage, which is why I recommend the shuttle buses. They’re cheaper anyway. Taxis are the worst option in my opinion, in large part because of the prevalence of dishonest drivers at the airport. If you decide to pay for a taxi, make sure they use the meter. Even then, some have rigged meters and some will make the trip much longer than it needs to be. You should never have to pay more than 120 Yuan and even that is pretty high. Additionally, most drivers will neither speak nor read English, so make sure you have your destination written down in Chinese. Beijing has many train stations, but most visitors will arrive at Beijing Railway Station, Beijing West Railway Station, Beijing South Railway Station or Beijing North Railway Station. Three of these have subway connections; the largest, Beijing West, does not. Taxis are the easiest way to get downtown, but they are naturally the most expensive option and the likelihood of getting scammed and paying even more is pretty high. Personally, I would take a public bus, but this can be a little intimidating. You’ll find a large sign indicating the routes on the station side of Lianhuachu Donglu or you could ask the information desk which bus you need. If you already have your accommodation picked out, they should have instructions on their website. Many also offer a free pickup from the station (the airport as well, in some cases). Another alternative is to walk to the Military Museum subway station (Line 1), which is about 15 minutes north of the railway station. From there, you’ll pay 2 Yuan to get downtown. Beijing has over twenty long distance bus stations. If arriving by bus, you’ll likely end up at the station on the edge of the city in the direction you came from. So if you are coming from the south, you’ll arrive at the bus station at the southern end of the city. Most bus stations are not connected to the metro, so you’ll have to take a taxi or a public bus. As always, I recommend the bus, if you can manage it. The Beijing subway system is the best way to get around. For those places not served by the subway, the bus system is even cheaper and goes pretty much everywhere, but it can be difficult if you don’t know any Chinese. You hotel staff will be happy to guide you to the correct bus, though. I’d advise against relying on taxis, but if you do, only take official taxis (official license plates have a Chinese symbol, then a B; any other letter and the taxi is fake) and get out immediately if the driver does not want to use a meter. Very few drivers will speak or read English, so you’ll need to be able to pronounce your destination correctly or have it written down in Chinese. Beijing has accommodation options in every price range. Hostel dorm beds are the cheapest options that are legally allowed to accept foreigners. I stayed at the Leo Hostel near Tiananmen Square when I was in Beijing and I really enjoyed my time there. It can get a bit loud for some tastes, as there’s often people drinking in the common room. If that’s not your thing, I’d suggest avoiding this place. The area is great though and you’ll find countless other options here (just click on the ‘show hotel on map’ link on the Leo Hostel page). A lot of places might fill up during popular times of the year, but in my opinion you don’t generally need to book in advance. When I went, I looked at a map of accommodation options and picked an area that seemed to my liking (Chongwen, south of Qianmen, where many budget hostels are located) then took a bus there from the train station. After walking around and checking out a few places, I found Leo’s. If you don’t have a map, you can use the accommodation map on Agoda’s Beijing page. Beijing has several popular nightlife areas, but if you ask for recommendations, chances are you’ll be directed to Sanlitun. It has long been the most popular area, which is unfortunate, since it’s pretty horrible. Luckily, it’s now considered the ‘old’ nightlife district and any newer clubs are located elsewhere. That’s not to say you can’t have a good time here, just that it’s a very touristy good time. And not in a fun way, but in a sleazy ‘let’s extract as much cash as we can from the drunk tourists’ way. Go to Sanlitun if you don’t know where else to go, but ask the staff at your accommodation for other options. There’s much better out there. Beijing’s most famous dish is Peking duck and you’re probably going to want to try it at least once. Try to stay away from the touristy restaurants if you can, but I know it can be hard to avoid them, especially if you’re going out with a group of people you just met in your hostel. You’ll spend more than you should at these places, though. For other meals, definitely try to stick to local restaurants or street food. You’ll find great little dumpling stalls and lamb kebab places where you can fill up for virtually nothing. The famous shopping street Wangfujing has stalls offering more exotic meats-on-a-stick (scorpion, locusts, starfish, etc). They’re overpriced here, but still relatively cheap and you’ll get some great pictures. Violent crime is rare, but petty theft is common in crowded areas like stations and tourist attractions. Pickpockets also work the crowded buses. Scams are very common in touristy areas, including the notorious tea house scam, where locals, usually young women, befriend you and invite you to join them in a tea house. When the bill arrives, it will be much higher than expected and the friendly young girls will be replaced by threatening men. Basically, do not follow any ‘students’ or Chinese ‘tourists’ anywhere. I’d advise against signing up for a tour to see the Great Wall and simply taking public transport instead, but if you do opt for a tour, book it through a hostel or a travel agent. Do not take the ultra-cheap tours offered on the streets. Also know that many tours will take you ‘shopping’ for most of the day and only toward the end will you get to the great wall. Specify beforehand that you do not want this (unless, of course, you do). Pollution could also be a problem for those with respiratory disorders, and I wouldn’t drink the tap water unless it has been boiled. Even then, you’re better off avoiding it. Tiananmen Square: the largest square on earth; there is a flag raising and lowering ceremony at the north end of the square at dawn and dusk.